From Sidmouth and Exeter turn right off the A3052 at hangman’s stone then straight on to Beer. At the bottom of the hill turn right – signed to the caves and Branscombe. From Seaton follow signs to the caves and Branscombe. This bus service goes past the caves every day except Sunday and no last service on a Saturday. The ride from the caves to Sidmouth is a real experience travelling on a bus in narrow country lanes. Click the button below for the timetable. It’s a lovely, but fairly steep walk from Branscombe to the Caves. 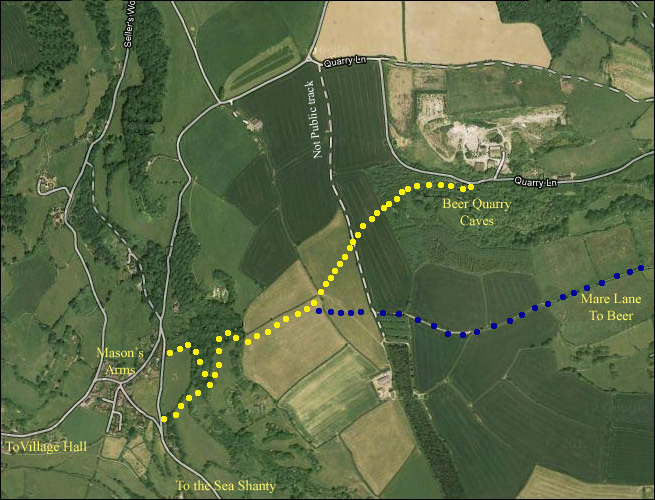 Follow the Public Footpath in Yellow Dots to get to the caves, just over 1 mile. The Blue dots will take you on to Beer via Mare Lane and Pecorama.